Many of you are familiar with Paul Bishop's work from his website Bishop Wire & Bead. You'll also recognize his name and his style from the artist profile that he shared with us here and the other wire wrapping tutorials that he's written for us. Let me tell you, we're extremely fortunate to have this new tutorial by Paul, because wire wrapping is not my strong point! So, thank you Paul so very much for blessing us again! As with Paul's other tutorials, it looks long, but it is filled with detail and advice. 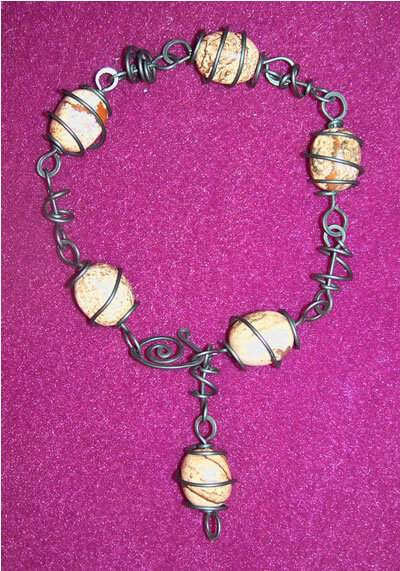 I used 19 gauge wire for this project because the holes in the picture jasper were fairly large. The wire is annealed black steel which you should be able to get very cheaply at a hardware store. My 50 feet (15.25 metre) roll of wire cost less than $5. I use this and copper wire as practice wire. When you think steel, you usually think of it as very hard. This wire is not. Even at 19 gauge it is actually very soft. We will strengthen it by hammering. You need all the same things except your choice of wire and stones. Start with picking your stones. Round or oval stones with holes through the long axis work best with the bead cages you'll make. Next, choose your wire for the links through the stones. The wire needs to fit through the stone comfortably but no more. A little play is fine as this will allow the bead to roll. The wire must bear the weight of the stones well. HOW MUCH WIRE TO MAKE A CAGE? Take a piece of string and wrap it three or four times around the stone with the largest middle, keeping the wrap perpendicular to the direction of the hole. This is a gauge for the MINIMUM of how much wire you'll need to make a bead cage for one of the stones. Three wraps is generally good for round stones, four or more for nuggets/barrels. 1. Cut a wire that length and straighten it. 2. Use the round nose pliers to make a small loop at both ends in opposite directions. It will look like a very long, skinny s (or if you're a math geek, an integral symbol). These loops should be just big enough for the wire to go through. 3. Holding the loop in the chain or flat pliers with the straight wire sticking out, push the wire toward the loop to start a tight spiral. 4. Move the spiral so the pliers hold onto the newest curve and push the wire again. 5. Do the same on the other side, alternating back and forth to come closer to the center of the wire, trying to keep the spirals the same size and tightness. 6. Using the pen or chopstick, push one spiral up in the center to separate the coils a little into a dome shape. 7. Do the same to the other spiral, making sure you push it out the other way. 8. With the center of the wire in the middle, gently fold one half of the spiral over onto the other so the domes point away from each other. Do not push it flat, just gently bend it together like a clamshell. This is a bead cage. Take one stone and insert it into the bead cage. The fit might be tight, but you can push the domes further out, and/or undo the spiral a little by twisting each end in opposite directions toward the center wire (like loosening a spring). The stone's hole should line up with the centers of the spirals. 1. Working directly from the spool, straighten the end of the wire and push it through the centre of one spiral, through the bead and out through the other spiral. 2. Use the round nose pliers to make a simple loop. Do not overlap the wires, just get them very close. 3. Push the caged bead away from the loop. 4. Lay the loop on the edge of the hammering surface and hammer the loop fairly flat. Be careful not to hit the bead, and don't make the wire too flat. Well-flattened wires become sharp-edged. 5. Use the chain nose pliers to gently push the loop closed again. The loop is much harder than before and the wire is also more brittle. 6. Push the caged bead back up to the flat loop. 7. Measure off enough wire and make another simple loop of similar size. 8. You can't push the bead away from the hammer this time, so be very careful hammering the loop. Gentle strikes without raising the hammer too high work best. 9. Again, use the pliers to close the link if the ends separate. That's one caged stone link. You can experiment with the length of the double-spiral wire to get more loops in a cage. In my design, caged stone links alternate with similar links with no stone. The no-stone links are shorter and the S-spirals smaller and more stretched, but the construction and loop hammering is the same. Repeat "Make The Cage", "Cage the Bead" and "Make It A Link" to make as many caged bead as you need. Make no-stone links as you need for your chosen pattern. To connect the component links, either twist a link loop open slightly and attach it to the next and close the loop, or put two loops on an open jumpring and close the jumpring. 1. Working from the wire coil, put a loop on the end and start a spiral with a little looseness. 2. After two or three full turns, make a sharp bend in the wire and pull it up past the other end of the spiral in a slight curve. It should start to look like an eye. 3. Imagine a line through the center of the spiral crossing the first bend. At the point where this line crossed the at the other end of the spiral, make another sharp bend and pull it back down the other side of the spiral. It should really look like an eye now. 4. Just past the middle of the spiral, leave enough to make a small loop, cut the wire and make the loop by curling the wire back onto itself away toward the last bend. 5. Bend the wire and tighten the spiral a little to get the sharp bends and center aligned. 6. Put the clasp on the hammering surface and hammer it, flipping it over every few strokes to even out the spread. 7. The wire will flatten and the spiral might undo a little. If that happens, gently bend the clasp back into shape. Hook one end of the bracelet over the loop, past the first bend to the second, then gently push the spiral into the outer wire to close the gap. This will keep the loop from sliding off the clasp. To wear the bracelet, hoop any loop over the other end of the clasp. It will notch into the bend and hold itself in place. My bracelet will fit up to a 9 inch wrist. If someone has a smaller wrist, the wearer can simply hook it further up the bracelet. Some people don't mind the excess weight dangling down, some do. All you have to do is open the loop and take the excess off. For someone who likes large stone necklaces, adde a few extra components to an existing bracelet to create one. Alternately, join two bracelets. To make earrings, make caged stone components with one loop end and one spiral end and put them on earwires. Copyright 2011 Paul Bishop. All rights reserved. Very unusual. I like the bead cages and all the unique links. Eileen took the words right out of my mouth: "great tutorial"! I always learn so much from you. I love the "cages" too. I really like those caged links. Thanks for sharing!